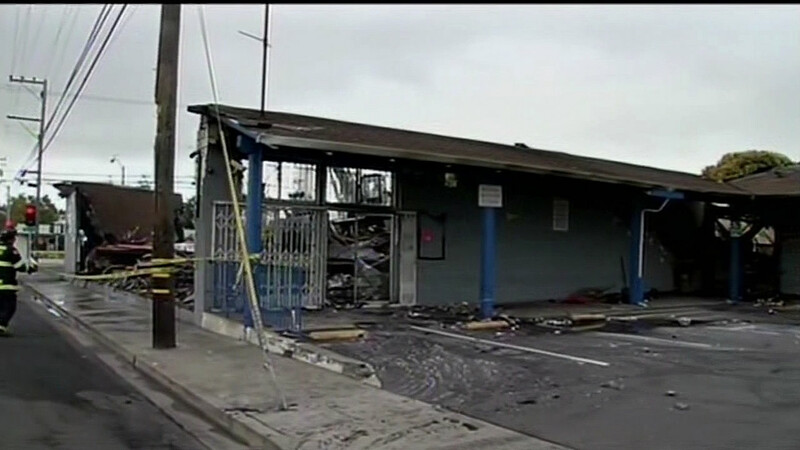 SAN LEANDRO, Calif. -- A massive fire that destroyed a San Leandro grocery store and damaged four other businesses early Monday morning was intentionally set, a San Leandro police lieutenant said. "The reality is based on extent of the damage and how quickly, how hot and how strong this fire burned, it clearly was deliberately set," police Lt. Robert McManus said today. The grocery store where the fire started, Marina Supermarket at 2181 Doolittle Drive, was demolished Tuesday but crews were still working on removing piles of debris from the area as of this morning, Alameda County fire spokeswoman Aisha Knowles said. The neighboring business owners are working to assess the damage and work with insurance companies to reopen as quickly as possible, Knowles said. Thrifty Medical Supply next to the market sustained extensive structural damage in the fire and for now proprietors are directing customers to the business's second location at 6700 Santa Rita Road in Pleasanton, according to an employee at the Pleasanton location. The owners of the other businesses -- Empire Smoke Shop, Ronaker's Coffee Shop and Loaan's Hair and Nails -- are only permitted limited access to their shops for the time being, Knowles said. The four-alarm fire was reported at 2:34 a.m. Monday and took firefighters nearly two hours to get under control. At one point, firefighters feared it could spread to a neighboring apartment building and evacuated 16 residents. During the fire, the roof of the supermarket collapsed, blowing out the store's windows toward the firefighters. The large amounts of water needed to fight the fire even caused a water main to burst nearby. The aging cast iron line at Barrow Street and Doolittle Drive couldn't handle firefighters quickly turning on and off the valves and broke, flooding areas of the street, according to the East Bay Municipal Utility District. Along with Alameda County firefighters, San Leandro police and the federal Bureau of Alcohol, Tobacco, Firearms and Explosives worked to determine the cause of the blaze.